As an organic chemistry student you will find yourself faced with acid/based questions again and again. From categorizing molecules to ranking their strength without pKa or pKb values. This isn’t terrible if/when you learn it correctly, however, your professor will assume you alredy know this. So s/he won’t teach it. Because you’re expected to remember this from back in general chemistry. Instead your professor will fly through the material and expect you to keep up. But this won’t help with the acid/base classifications. Simply memorizing definitions without true understanding won’t make it any easier. Especially when faced with a molecule that appears to fit more than one acid/base definition. 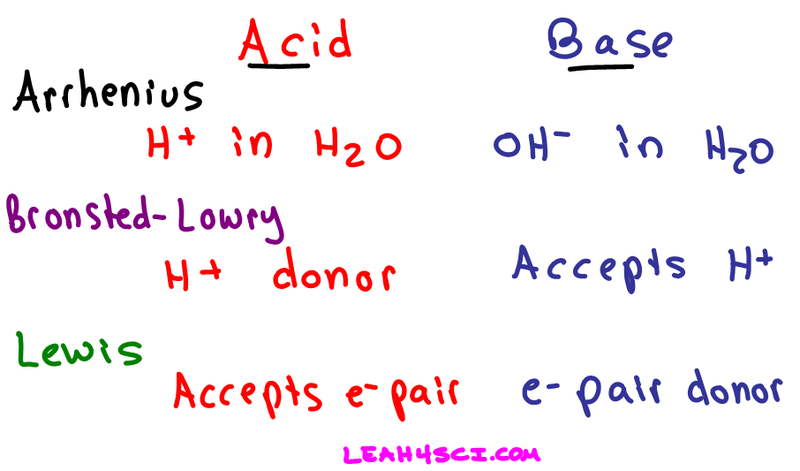 So let’s take a look at acid/base definitions in a more logical way. The key here is to recognize that while each classification has a specific definition, any given molecule can fall into more than one category, some into all 3. Again, something we’ll look at later in this article. An Arrhenius acid is a molecule that when dissolved in water will donate an H+ in solution. Simply put, a proton donor. The trick to recognizing an Arrhenius acid is to look for a molecule that starts with an H, and typically contains an oxygen or halogen. An acid dissociating in water does not form a free-floating proton. Instead one of the water molecules in solution will grab the H+ yielding a hydronium or H3O+ ion. Here’s what happens when nitric acid dissociates in water. An Arrhenius base is a molecule that when dissolved in water will break down to yield an OH- or hydroxide in solution. To recognize the Arrhenius base look for a molecule ending in OH, but not following CHx which refers to an alcohol. But what if the acid/base is not dissolved in water? The Arrhenius definition for acids and bases only refers to compounds dissolved in water. Does this mean that acids and bases cannot exist out of water? Not quite, that’s where the Bronsted-Lowry definition comes in. A Bronsted-Lowry acid, like an Arrhenius acid, is a compound that breaks down to give an H+ in solution. The only difference is that the solution does not have to be water. We can still refer to the exact same acids as listed for the Arrhenius acid examples, but this time we’ll change the solvent to ammonia, alcohol, or anything else. Nitric acid still dissolved to yield an H+ and NO3-, but this time it was NH3 and not water that picked up the free-floating proton. This is where we start to see the difference between the Bronsted-Lowry and Arrhenius definitions. While the Arrhenius base referred specifically to the hydroxide (OH-) ion, the Bronsted-Lowry base refers to any atom or ion capable of accepting or bonding to a free proton in solution. Referring back to the HNO3 + NH3 reaction above, when ammonia picks up the free H+ it acts as a proton-acceptor. NH3 is the Bronsted-Lowry base in this example. The Lewis definition for acids and bases is the most extreme because it’s not dealing with protons specifically. Instead the Lewis definition deals with the movement of electrons. A Lewis acid refers to an atom or molecule that accepts an electron pair. Think back to your ‘pushing arrows’ for orgo mechanisms. Every time you draw an arrow representing the movement of electrons, the atom getting attacked or accepting those electrons is the Lewis acid in that reaction. 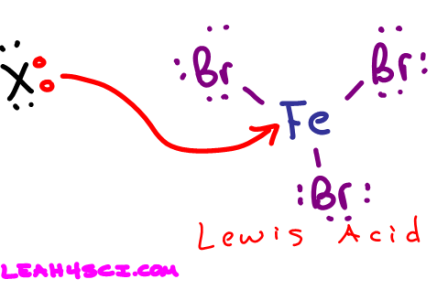 Since the Lewis definition has to do with the transfer of electrons, you can guess by now that a Lewis Base is an electron pair donor. Once again think back to your reaction mechanisms. The molecule using its electrons to attack another atom is an electron pair donor and a Lewis Base. Here is the first step in acid catalyzed hydration. The pi bond attacking H+ makes the alkene a Lewis Base. What If It Fits More Than 1 Category? After learning the individual acid/base definitions you’re likely confused and overwhelmed. So much information and so very similar! And what happens if a molecule appears to fit more than one category? Is OH- an Arrhenius Base? Or perhaps its a Bronsted-Lowry or even Lewis Base? The answer is potentially all 3! The definitions above evolved slowly as scientists were starting to understand more and more details about chemical reactions. The first is a basic (no pun intended) definition, but the last 2 simply expand to fit more complex solvents and situations. Take a look at the reaction below where the hydroxide ion attacks a proton on hydronium. Arrhenius Acid Definition: Hydronium breaks up to yield an H+ in solution. Arrhenius Base Definition: Hydroxide is an OH- dissolved in water. Bronsted-Lowry Base Definition: Hydroxide attacks and accepts the H+ from hydronium. Lewis Acid Definition: The H+ on Hydronium accepts the attacking electron pair to form a bond. 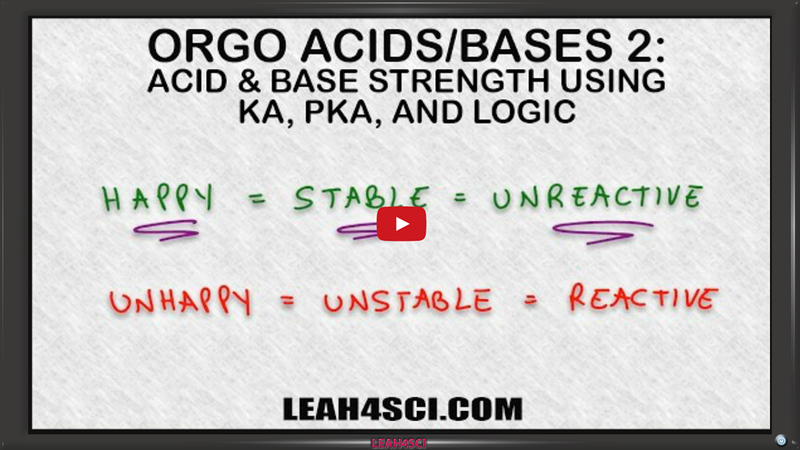 Now that you understand the similarities/difference between Arrhenius, Bronsted-Lowry, and Lewis acids and bases, how do you tell which is the stronger or weaker acid? Which molecule is more reactive? Which side of a reaction will be favored at equilibrium? As an organic chemistry student you will be required to recognize and classify 3 different types of acids and bases. Arrhenius, Bronsted-Lowry, and Lewis. While the technical definitions vary, once you get the logic behind their definitions you’ll be able to quickly and easily identify the different types of acids and bases. 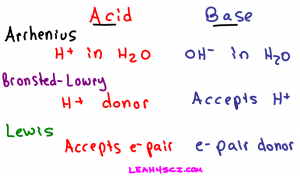 Want to test your understanding of acids and bases? 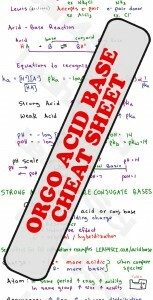 Click to try the FREE Acid/Base practice quiz. Thank you so much… Nice n clear explanation! Do you teach physical chemistry? Thank you Banda. When you say ‘learn more’ what specifically are you referring to?